'Wheatly', the E.D. 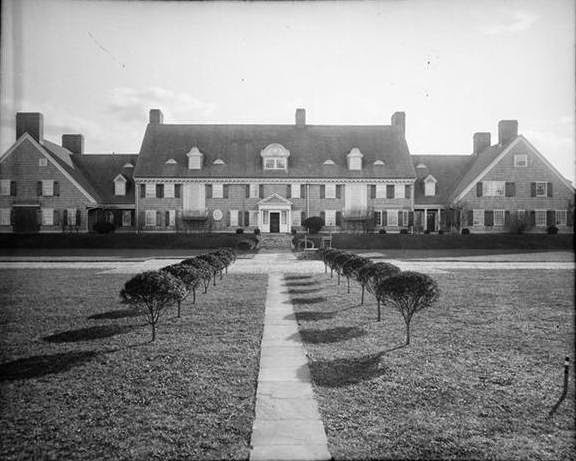 Morgan III estate designed by McKim, Mead & White between 1890-1900 in Old Westbury pictured in 1891 shortly after the main house was completed. Click HERE and HERE for more on 'Wheatly'. Photo from the Museum of the City of New York. Zach's two links don't pull up all previous photos posted of 'Wheatly' (no offense meant, Zach); so if you type 'Wheatly' into the search box you'll see a nice progression of this courtyard as it matured (including adding the reflecting pool with fountain). My favorite photo was posted on December 18, 2012. Doug ~ re: " my favorite photo" Please check out architectural historian Wayne Andrews' "Architecture, Ambition and Americans" ( page 195 ) for the same view taken in the late 1940s, when Wheatly was in decline. Yet another view of the entry-arch, wing, taken by Andrews on the same visit, appears in his "Architecture in New York, A Photographic History." ( page 108 ) Haunting images ! Looking at the facade straight on really emphasizes the enormity of the place, an unfortunate factor leading to the demise of the property. Tyngsboro, thanks. To me the comparison is made even more haunting by the two gardeners in the earlier photo ... they're gone, the work they did has disappeared. Yes, Doug, and aren't we glad the photographer included them, besides their lawn mower, in the scene as they provide us with a sense of scale for the building. I can't believe that all this beauty, that once existed, is lost forever ~ but that at some point in the future it can be experienced again on some higher level ! Tyngsboro,can we view those photos online? I tried to google the book, but only came up with descriptions. No Zach, make everyone go to the library like I did. I knew where the library was but had to ask for help when I got there because they have computers now ... I spent 15 minutes looking for those little file drawers full of index cards. But now I feel like I've grown as a person. I miss those "litle file drawers full of index cards" ~ when the dastardly computers go down, for whatever reason, everyone gets testy !